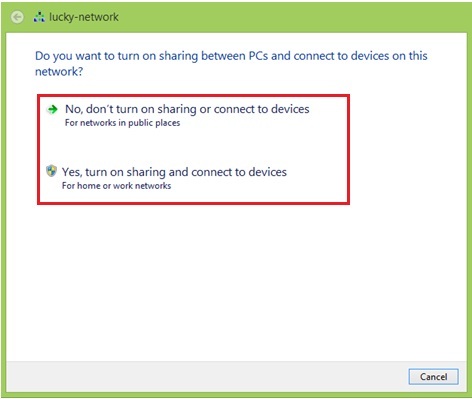 When you connect Windows 8 to wired or wireless network the first time, by default it will be set to Public network if you don’t turn on sharing or connect to devices when you are asked. Somehow you cannot simply change it in Network and Sharing Center later, just like how you did in Windows 7 or Vista in the past. Although you will be shown the existing network location type, but you cannot click on it in order to change it. In this case, the network location type of my wireless network (lucky-network) is set to Public network. 1) Go to the Desktop environment on Start screen, click on the network icon on your lower right corner. 2) Go ahead to right click the active network connection, you can then click Turn sharing on or off on your connection in order to change network location type. 3) You will be shown one of the screens as shown below for you to turn on or off the sharing, so feel free to change it in order to change network location type. 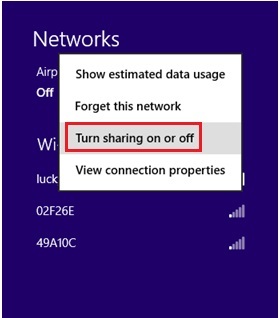 Turn on sharing or connect to devices – Network location type will be changed to Private network and you should turn on this if your laptop is connected to home or office network. Network discovery option will be enabled once you have selected this option. Don’t turn on sharing or connect to devices – Network location type will be changed to Public network and no network discovery feature will be enabled if you select this option. Note: If you want to find out what type of sharing has been enabled, just click on Change advanced sharing settings in Network and Sharing Center to explore more. Return to top of "How to Change Network Location Type in Windows 8"! !